Remember Dug's joke from the movie Up? "Hey, I know a joke! A squirrel walks up to a tree and says, 'I forgot to store acorns for the winter and now I am dead.' Ha! It is funny because the squirrel gets dead." "Two muffins were baking in the oven. One muffin said to the other, 'Man, it's hot in here.' The other muffin said, 'Aaaagh! A talking muffin!'" Then there's that joke about sour cream going bad. That's another one I don't get. Everything goes bad, even under ideal storage conditions. Everything peaks, then begins to decline. Even blue cheese gets a little more blue. We don't consume much cheese or sour cream at home, and I've made peace with waste. I don't know that we're going to get sick from extra-blue cheese, but I replace it knowing that at the very least, the cheese is no longer good. The mold that gives it its flavor to begin with has overrun the cheese. With a few exceptions (leftovers and orange juice among them) I'm not a keen observer of dates on the foods in our fridge. This horrifies everyone else under my roof. But I'm the main shopper and cook and feel confident in my assessment of freshness. But it'd be nice if there was a firm date on things. A "Don't Even Consider Eating Past" date. But that doesn't exist. I poked around the USDA for a bit and found no hard answers. I think it's because the rate of deterioration is very much dependent on storage conditions. The "Sell-By," "Use By," and "Best if Used By (or Before)" are mostly recommendations. In fact the dates on packaged foods we call expiration dates are not safety dates, they are the manufacturer's estimation of freshness. Only infant formula and some baby food have hard expirations and cannot be sold once those dates have passed. I wish I had something concrete, other than the old smell-it or pour-it-in-your-coffee-and-see-if-it-curdles test. But I think I'll have to continue to convince my family that milk past the date on the container is fine until I say it's not. 1. Leftovers and deli meats must be eaten within 72 hours of the time you first put them in your fridge. 2. Buttermilk is usually fine for a month past the date. 3. Cream cheese and sour cream should tossed one week after opening the package, regardless of the date on the package. 3. Dispose of anything that smells bad, meat included. Get used to smelling things. If you plan to eat it, you should be willing to smell it. More time to kill? Read Food Expiration Dates: What Do They Really Mean? From Swedish Medical Center in Seattle. The pickles were quite nice, in case you were curious. I made them with about half the amount of sesame oil and a very generous pinch of chili flakes. In other news, it was a good week for tuna sleuthing. All it took was a word from the family tuna expert. No, not a, "I know a guy..." kind of word. I live in Chicago. I know my own guy. The word in this particular case was tonno. When I added tonno to the "tuna packed in olive oil" Google search, it quickly produced some leads. Turns out Chicken of the Sea introduced a brand of Italian-style tuna a few years ago. The brand is called Genova. 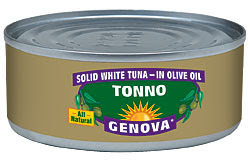 Genova makes a solid light (yellowfin) and a solid white (albacore) product, packed in olive oil or water. I'm only interested in the olive oil ones. The solid light isn't terrible (it's actually the same stuff I tried a few months ago from my local Treasure Island. Chicken of the Sea's online product search says it's also available locally at Dominick's). The one I want, the solid white, is not available in Chicago (or Seattle, or Denver). It is, fortunately, sold across my ancestral grounds of Westchester County. Which means after our annual summer visit I'll be the annoyance trying to pass thru security with a case of tuna on my person. Popcorn has been a favorite afterschool snack since I was a kid. It might be the first thing I learned to cook. We had an old aluminum pot, probably about 2 quart capacity. I knew precisely how much oil to add to the pot without measuring it, and how many kernels should cover the bottom of the pot to ensure that when most of the kernels were popped the cover would lift off the pot, floating like a crowd surfer over an inch or two of popcorn. In my own kitchen I have a dedicated popcorn pot. It’s huge - like 10 quart capacity. I was probably hungry when I bought it. 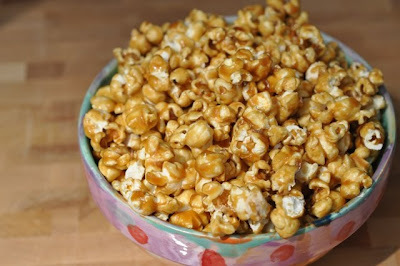 To serve regular, salted popcorn to my popcorn-loving family of four, I cover the bottom of the pot with canola oil, heat it over medium-high heat for a minute or so, then add 1 cup of kernels. Cover and let nature run its course. 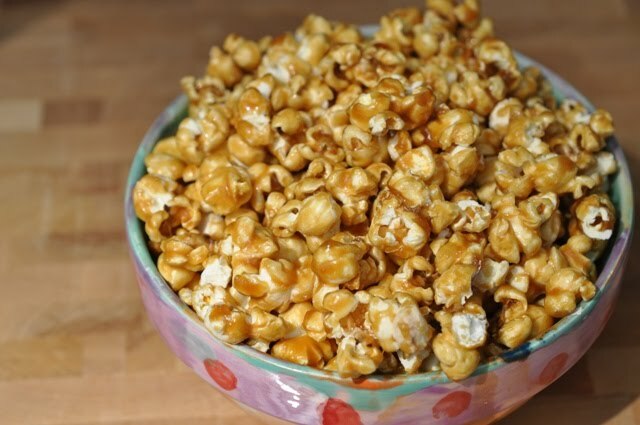 When popping slows, remove the lid quickly (moisture and excess oil from the popped corn will have accumulated on the lid), dump the popcorn into a big bowl and salt generously. Kurt recommends Morton’s popcorn salt - a finer salt. I have some but still kinda prefer my salt-shaker of Redmond Real Salt. Caramel corn is a different bird. When I was a kid we made it every once in a while, using a recipe from the Joy of Cooking, molasses and butter. It was good, don’t get me wrong, but nothing to write home about. 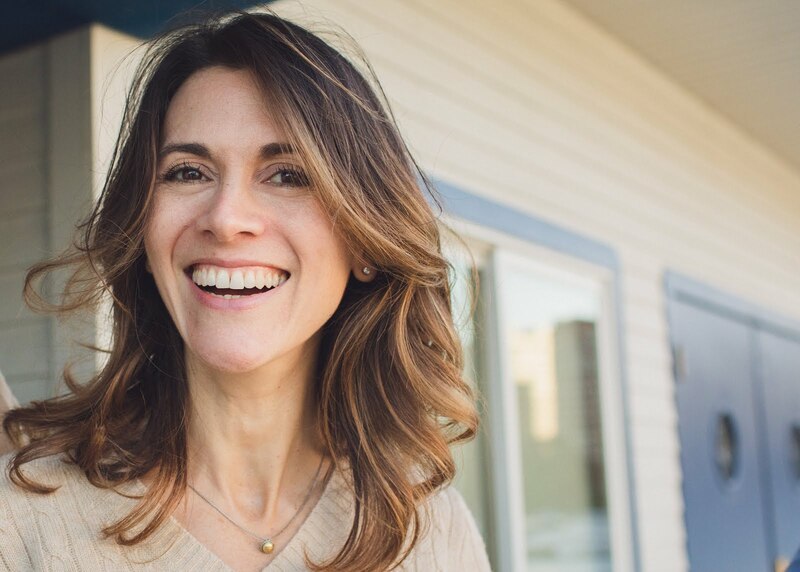 When my daughter was researching Cracker Jack, which made its debut at Chicago’s first World’s Fair in 1893, we made a batch from a recipe another parent found online. This one called for brown sugar instead of molasses (an improvement, to be sure). It was better than both regular Cracker Jack and my childhood version. What made it better than Cracker Jack was the butter, and what made it better than the Joy of Cooking recipe, in addition to the molasses/brown sugar substitution, was that after sousing the corn with caramel, you bake it on a sheetpan in the oven. The final result was crispier and snappier. And it’s good for a few days, if you can keep your mitts off it that long. Heat oil in a large pot over medium-high heat. Add popcorn. Shake pan occasionally as corn pops. Keep over the heat until popping slows down. Empty popped corn into a large bowl. Add salt and flip to distribute evenly. Transfer to a baking sheet. Partially melt butter in a medium saucepan over medium-high heat. Add brown sugar, corn syrup and baking soda and bring to a boil. Cook, without stirring, until mixture reaches 235 on a candy thermometer, about 8 minutes. Remove from heat and pour over popcorn, stirring with a heat-resistant spatula or buttered spoon. Work quickly to spread it evenly. Bake popcorn for 20-30 minutes, stirring every 5-10 minutes to continue coating uniformly. Remove pan from oven; cool on a wire rack or a cool cook top. Allow to cool for a few minutes, then break apart any clumps of popcorn using your hands or two teaspoons. Still hungry? Try Kettle Corn! I'm surly about tuna right now. It's something of a staple in our home. It's something of a staple when we travel. When we were abroad last summer I took along one of those jazzy neoprene lunch totes so we could picnic. I love picnicking, especially when travelling. For one, eating out gets tiresome. Two, checking out local food markets is fun tourism. Three, sitting in a park in the shade or sun - and the inevitable short siesta that follows - is awesome. We enjoyed several memorable picnics last summer. Gyros in Hyde Park, boulangerie baguettes at Place de Vosges, proscuitto cotto, olives and ciabatta in Corniglia. Almost every other lunch featured small cans of solid tuna packed in olive oil. It was something of a revelation, and very easy picnic food. Simply drain the oil and eat. The oil softened the tuna much the way mayo would were we preparing it at home. Trouble is, I got hooked on it and had not been able to source a comparable product stateside. Sure, there's a $6 can at Whole Foods, but that's not what I'm looking for. Our summer tuna was a pretty generic item. Coop, the Italian super-coop grocery store, carries it under their own label. I've got tuna on the brain because last week I was preparing for a dinner party and made stops at all my favorite grocers, checking the canned isle just one more time. Nothing. The only thing that came close was at Treasure Island, but we already tried it and it wasn't the same. Thanks to an email alert from the NY Times, I've got something to be excited about this week. It's pickles. The kind only I - in my house - love. They're more like cucumber than pickle, with no dill and a short marinating time. I can't be sure they'll be as good as the ones at Wild Ginger in Seattle, but they do look promising, don't they? Wanna try them too? 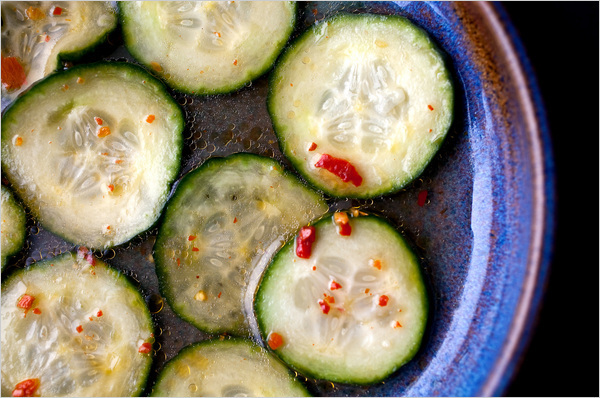 Check out the recipe for Quick Sweet and Sour Cucumber Pickles here. Nuts! I keep a lot of nuts in my fridge. The healthy oils in nuts will cause them to go rancid, so storing them away from light and heat is key. The freezer works, too, especially for longer-term storage. Out of the fridge, it's really important to toast them. Even a scant five minutes in a preheated oven will release some of the oils and flavor. And don't assume that just because you're baking that banana bread that you don't need to toast the pecans before adding them to the batter. Toast, gentle reader, and your banana bread will be that much better. Almonds, sliced - Trader Joe's. I love sliced almonds on my cereal, in granola, on quinoa, and of course, the almond croissant. Pecans, halves and pieces - Trader Joe's or, during the fall/holiday season where I use many, many pecans, Costco. The large bags of pecans are some of the best tasting nuts around, and make for an amazing pecan pie. Walnuts - Costco, in the large bag. Hazelnuts - Trader Joe's. I buy the raw ones, then roast them and rub them between my hands to remove the skins before making biscotti or tea cakes. Pine nuts, a/k/a pignoli - Trader Joe's. I get the raw ones and toast them myself for about 2 minutes in the toaster oven before tossing them in the Cuisinart to make pesto. Pumpkin Seeds and Sunflower Seeds - I find the best price and quality at Trader Joe's. Both seeds are essential to Granola. Peanuts in the Shell - I like the Cubs ones they sell at Dominick's. The Planters ones are horrid. Cocktail Peanuts - We always have these around for GORP, the world's best snack. I get Planter's low sodium cocktail peanuts at Target. Blue Diamond Smokehouse Almonds - These are a serious treat. I hardly want to even get anyone else hooked on them. The damage was done when Costco carried them. Since the little cans just won't do, I pick up one-pound packages at Walgreen's.